These Serrano ham and Cheddar cheese straws are a fantastic combination and make for a great recipe. 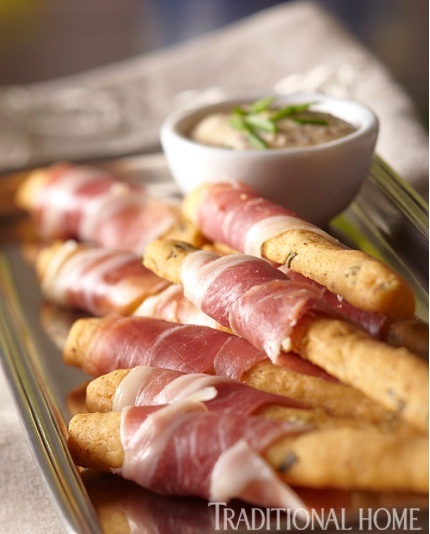 I am obsessed with the saltiness of the cured ham and buttery richness of the cheddar straws. The straws also have a hint of rosemary which make them more upscale and gourmet than what you would find at the grocery store. Find the recipes at Traditionalhome.com but if you want to stay here try some of our favorite appetizers: fried artichokes with basil aioli and baked goat cheese wrapped with bacon. Thanks for stopping and we hope you come back! One last thing before you go, what is your favorite appetizer to serve at a party?